This was a sleeper series in my library. I read almost everyone with my son when he was four and five years old, and he just loved them. I couldn’t figure out why my students weren’t reading the books. It turns out that my students just didn’t find the covers interesting. So, I asked one of my second grade teachers to try reading the series out loud to her students. Oh my goodness. She loved the series and so did they. I can’t keep these books on the shelves anymore. Her entire second grade is now excited about these books, and my teacher said she will read them to her new second grade students next year. What are the Magic Treehouse books? These short chapter books are books that combine history with adventure, magic and suspense, perfect for first and second graders. There are even picture to break up the text. Jack and Annie are brother and sister. While playing near the woods in Frog Creek Pennsylvania, Annie, Jack’s younger sister, spots a tree house high in a tree. She, the more adventurous of the two, climbs up to the tree house. Jack, the more cautious of the two, follows her reluctantly. They find books in the tree house on all different topics. Jack, a big reader, picks up one of the books on dinosaurs. Looking at a page, he says, “I wish I could see a Pteradon.” No sooner has he said it, but there is a Pteradon outside the treehouse. Annie runs out to meet it, much to Jack’s dismay. 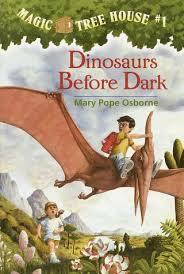 So begins Jack and Annie’s first adventure with the Magic Tree House. Once hooked, as my students now are, students can visit Pompeii, Ninjas, Pirates, the Titanic, the Amazon and many more places. Not only does this wonderful and engaging series go on for 48 books, but it is accompanied by non-fiction readers for those students interesting in learning more about the topics in the books. I highly recommend this series as a read aloud to younger students and as a great early chapter book for first, second and third grade readers.